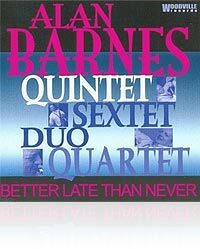 Barnes recorded these 12 tracks in 1993, but never got around to preparing them for release, hence the title. Had he not owned up to this I doubt if anyone would have noticed. All the characteristics of his style were well in place 10 years ago, along with that air of confidence and good humour that seem to surround all his enterprises. His playing is wonderfully free of stylistic restraint. He moves from Ellington to bossa nova to ballad to hard bop with complete conviction. Listen out for the rhythm section of David Newton, Paul Morgan and Mark Taylor. Whatever the instrument, Alan plays it hard and fast and with the sort of inventive flexibility and invention that ensures that he has his own sound and style and could not be easily be confused with another player. And in these days of musical conformity that is quite something. Alan is the main attraction here but all the supporting musicians play well and exceptionally well in the case of David Newton and Mark Taylor.